Miriam O’Callaghan talks to Tom Vaughan-Lawlor and Mark O’Rowe ahead of Howie the Rookie returning to the Olympia Theatre. Read Fintan O’Toole on Tom Vaughan-Lawlor’s ‘stunning performance‘ in Howie the Rookie, written by the ‘blazingly talented‘ Mark O’Rowe in the Irish Times. Read Liam Rudden’s interview with Tom Vaughan-Lawlor for Edinburgh Evening news here, as Howie the Rookie plays Assembly Hall at this years Edinburgh Fringe. David Hennessy interviews Tom Vaughan-Lawlor in The Irish World here ahead of it’s run in Edinburgh at Assembly Hall. 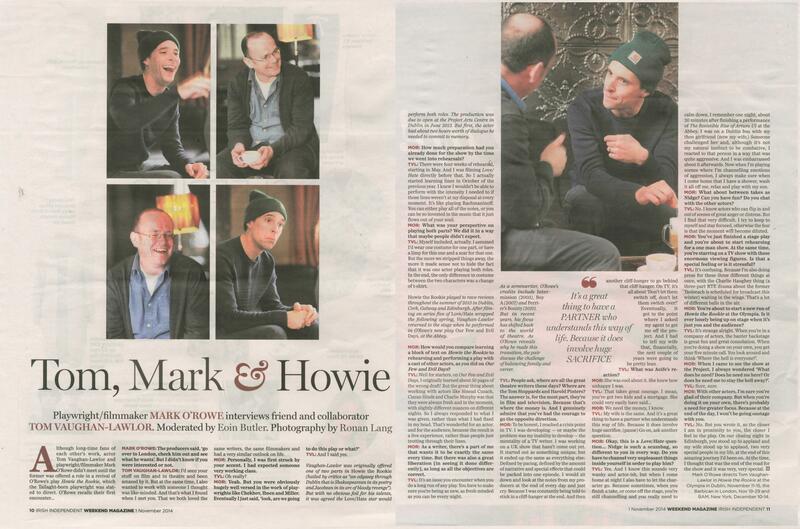 The Irish Examiner features Howie the Rookie and star Tom Vaughan-Lawlor in an article by Pádraic Killeen. THOUGH he’s popularly known as ‘Nidge’ from RTÉ’s hit drama Love/Hate, Tom Vaughan-Lawlor has been a much admired stage actor for many years. Listen to Tom Vaughan Lawlor being interviewed by Neil Prendeville of 96fm ahead of performances of Howie the Rookie in Cork.